"Sunbeam performance in the Scott Trial was outstanding for a decade." So wrote the late Philip H. Smith, in his light-hearted history of the classic Scott motor-cycle trials, published in 1963. The event, originated in 1914 as a test limited to riders of Scott motorcycles, but when it resumed after the Great War, other marques were permitted to compete. Riders were classified as 'trade' or 'amateur', rather in the manner of cricket distinguishing between 'players' and 'gentlemen', although the distinction was dropped after the 1927 event. One man who made a great contribution to the Sunbeam successes, from 1925 to 1935 was Eddie Flintoff. Thomas Edward Flintoff, was born in 1900 at Scorton Grange, Bolton on Swale, North Yorkshire. His father Charles, the son of a Yorkshire farmer had married in 1899, Mary Eugenie Sowden, a farmer's daughter from Liskeard, Cornwall. A second son, Stanley was born in 1901. Ten years later, the family were farming at Snow Hall, Great Ayton, and in 1921 they moved to Tyersal Hall, Bradford. That was the time that Eddie bought his first Sunbeam, and joined the Bradford Motor Cycle Club, and later the Ilkley and District Motor Cycle Club. He immediately participated in Club competitions, and quickly displayed riding skills which enabled him, at his third attempt in the Scott Trial, to win the Raymond Bailey Cup for the Best Performance in the 1925 event, in which he was riding as an amateur. The following year, as a 'trade' rider, he again achieved the Best Performance in the Trial. In 1927 the best 'trade' performance was achieved by George Dance, and supported by Harold Fearnside and Eddie Flintoff, Sunbeam won the Trade Team Prize. The marking system for the Scott Trial took into account both the time taken to complete the course, and the rider's performances at the various 'observed sections'. In 1928, Flintoff did not feature in the top three Best Performances, but nevertheless set the fastest time, and repeated this in 1929, whilst coming second on overall performance to Vic Brittain, also on a Sunbeam; these two, together with Charlie Helm won the Manufacturer's Team Prize. Incidentally 1929 was the first time that Scott riders were outnumbered by another marque - 15 Sunbeams against 13 Scotts among the 119 starters in the event. In the period 1930-35, Sunbeam won the Manufacturer's Team Prize on five out of the six occasions; the Panther team won in 1934. Eddie Flintoff was in the Sunbeam team on all five occasions, and twice won the award for Best Performance on Time only. In 1930 and 1932, younger brother Stanley Flintoff was also a member of the successful Sunbeam Team. Stanley's competition riding was limited, as he continued to run the farm with his father; whilst Eddie was employed at a garage in Bradford, and fettled his machines in 'the tuning shed' at the farm. This became a meeting place for local enthusiasts, and a neighbour, John Hudson who later became a trouble shooter and technical writer for Norton, acknowledged that much of his motorcycling knowledge derived from the hours spent in that shed. When Stanley married he and his new wife lived in a cottage on the farm. Father, Charles Flintoff died in 1946, and Stanley died in 1956, at the age of 55, having previously retired to the Lake District. "The team machines display a rugged individuality in style and preparation". By contrast there is a photograph showing Eddie Flintoff having won the main race of the day at Esholt Park, Bradford, riding the "spare 1929 T.T. Sunbeam machine". This machine remained in Eddie's ownership and was progressively adapted for trials use, with a sumpguard, and the characteristic Flintoff oil-pump guard and acquiring a four-speed, foot-change gearbox in the mid-1930's. After WW2 a set of telescopic forks, courtesy of B.S.A. were fitted, and in this guise, the machine was ridden in the Scott Trial as late as 1954. Freak hill climbs became popular in the mid 1920's, and Eddie competed at Moor End, near Kettlewell, considered to be "the worst hill in England"! When 'The Yorkshire Evening Post' purchased land at Post Hill, Leeds and invited the Leeds Motor Club to organise sporting competitions, both the Flintoff brothers entered the first event in July 1926, and Eddie won the knock-out competition. Subsequently he held the National record for climbing this freak hill, and also competed at Hepolite Scar, Bradford. Like many sporting motorcyclists of the period Eddie Flintoff tried his hand at many forms of competition, including sand racing at Redcar, Saltburn and Southport; local grass tracks and speedway at Fullerton, Leeds. The latter he did not take a liking to, perhaps deterred by an early fall resulting in a broken collar-bone. This incident would have been prior to the introduction of the Sunbeam Dirt Track Racing model, and Eddie had probably been using his flat-tank "hill climb" machine. Eddie also competed at the first race meeting at Donington Park, in 1931 when the circuit had a loose gravel surface. As his competitive riding reduced, Eddie committed himself to the organisation and running of club competitions. The high esteem in which he was held was marked in September 1947, when he was entertained by his friends in the Bradford and District Motor Club, and the Ilkley Club, and presented with a handsome silver rose bowl as a memento of the occasion. 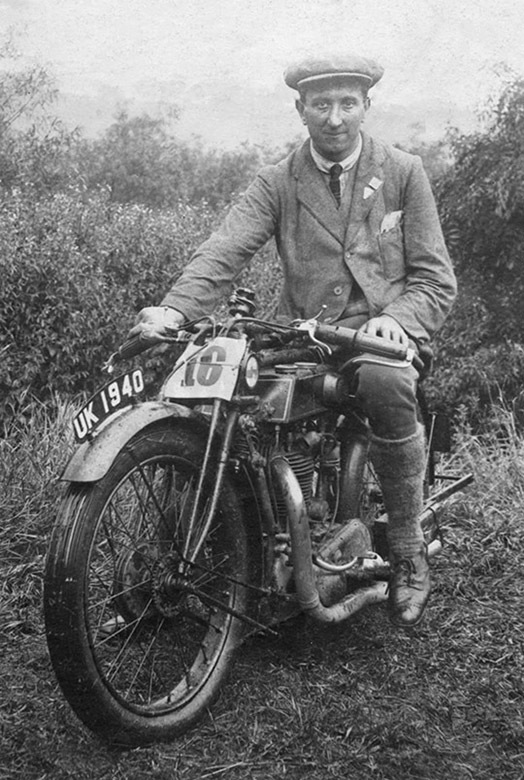 President of both Clubs, and in 1946 became President of the Yorkshire Centre of the A.C.U..
Eddie Flintoff, unlike his close friend Oliver Langton, and others of their contemporaries did not become a member of the Vintage Motor Cycle Club. He did however acquire an early 1920's Sunbeam, complete with footboards and beaded edge tyres, on which to participate in the Ilkley Reunion Trial, in which he was a consistent award winner into the 1970's. Eddie Flintoff continued to live at Tyersal Hall, but following an accident at the farm, he died in hospital on 23rd November 1984. The writer gratefully acknowledges the assistance of Maurice Rispin, who generously recalled his friendship with Eddie Flintoff over many years, and permitted use of the accompanying photograph.